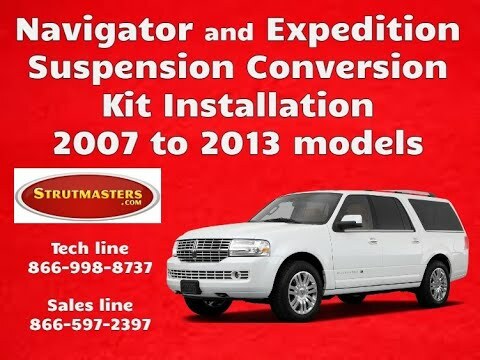 2007-2013 (2WD and 4WD models)¬† Navigator Air Strut To Passive Coil Over Strut Conversion is the perfect solution to your air suspension problems. Designed to be very affordable, you can convert your ENTIRE air suspension to use Strutmasters passive struts and coil springs for less than the price of replacing just ONE Original Equipment air strut at the dealer. 2007-2013 Lincoln Navigator 4 Wheel Air Suspension Conversion Kit (FX34F) is the perfect solution to your air suspension problems. Designed to be very affordable, you can convert your air suspension to use standard. 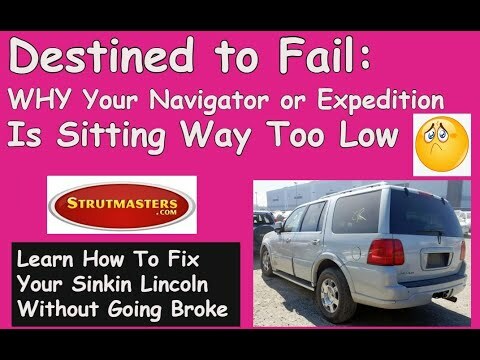 Our Lincoln Navigator customers know Strutmasters is the expert on suspension conversion systems. The reason they make the change from air to non-air suspension conversion kits is the low price and high quality of the parts we use. 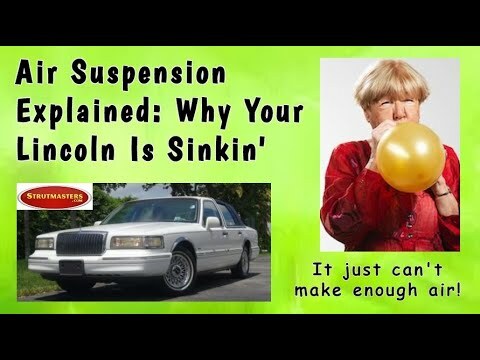 This suspension conversion system gets rid of the complicated parts and electrical components that keep failing on your Lincoln Navigator. Instead, this direct replacement comes with four coil over strut assemblies that are ready to go. The parts are very reliable, more so than the OEM equipment, and come with our limited lifetime warranty. The kit is installed easily, in about one hour per wheel, and you can do it yourself. The detailed instructions include a procedure to bypass the suspension warning light related to the failed components.¬† Watch videos of our experts performing real life suspension conversion on our exclusive YouTube channel. And, as if that isn't good enough, we have in-house technicians available to answer any suspension questions you may have with regards to your Lincoln Navigator. Your 2007-2013 Lincoln Navigator may be suffering from a bad or leaking air suspension. There are a few signs to look for when you‚Äôre trying to diagnose if it has failed or is failing. One obvious symptom of suspension total failure is a big difference in ride height from the front to back of the Navigator. Usually with a Navigator, drivers notice the rear sagging first making the front look inflated. It‚Äôs described as looking like it‚Äôs squatting down too low to the ground. Another thing to watch out for is a suspension warning message illuminated on the instrument panel. Other vehicle components will wear out, like the air suspension compressor. Check to see if it is running too often (never longer than fifteen-20 seconds) or not working at all. That‚Äôs a sign you need a suspension repair. Check the rear air springs- if you see visible cracks, that is from dry rot. Some cracks in the rubber air springs may be not been seen until the units are removed from the vehicle.¬† If any of these signs are present in your Lincoln Navigator, you may need a replacement. + Air Struts ($820/ each) + Solenoids ($125) + Compressor and Dryer Assembly ($720) = TOTAL: Over $4,125¬†(and that doesn√¢¬Ä¬ôt even include replacing electronic components that are known to fail such as the height sensors). + Front Air Strut Assemblies ($699.00/pair) + Rear Air Strut Assemblies ($699/pair) + Compressor ($200) + Dryer Assembly ($40.00) = TOTAL: Over $1,600 (and that still doesn‚Äôt include replacing electronic components that are known to fail such as the height sensors). 2007-2013 Lincoln Navigator Air Struts (x4)- conventional struts that use a rubber air spring instead of a steel coil spring.¬† Also called air bags, the air springs are made of plastic and rubber bag and use pressurized air to support the weight of the vehicle.¬† These rubber air springs dry rot and crack with normal wear and tear and that is the number one cause of all air suspension leaks. All air struts go bad at about the same rate. If one is leaking, the others will not be far behind. For a proper repair, all of them need to be replaced at the same time. 2007-2013 Lincoln Navigator Air Lines- tubes that run from a compressor (air suspension) to the air struts which carry pressurized air to the air bags components in order to adjust the height of the vehicle, respectively. 2007-2013 Lincoln Navigator Solenoids (x4)- This vehicle is equipped with 4 solenoids. These plastic components connect the electrical connection and lines of suspension components to the suspension control module. The solenoids are responsible for regulating the air pressure in each air spring or air shock. Solenoids are a small piece of the suspension system but they play a big role in how well it functions. If a solenoid is not working properly, it will cause the vehicle to be unlevel and, in turn, cause the compressor to burn out. 2007-2013 Lincoln Navigator Compressor- This vehicle is equipped with one air suspension compressor. The compressor is responsible for pumping up the air springs and shocks. When the air suspension starts leaking, the compressor is forced to run continuously to try and keep the air springs inflated. After a couple of days of running non-stop, the compressor will burn itself out. Replacing the compressor is a timely and expensive project to undertake. 2007-2013 Lincoln Navigator Dryer Assembly- This vehicle is equipped with a dryer assembly. The dryer assembly is responsible for getting moisture out of the air lines. Once the air suspension parts start to leak, moisture will build up throughout the air system. Moisture damages the air suspension components from the inside out. The dryer must be replaced whenever the compressor is replaced to prevent further damage. 2007-2013 Lincoln Navigator Suspension Control Module- This vehicle is equipped with a suspension control module. This module is the brain of the suspension system and it reads all of the signals that are being sent by the height sensors and determines if the vehicle needs to be raised or lowered. 2007-2013 Lincoln Navigator O-rings- Although they are the least expensive parts of the air suspension, they are responsible for maintaining the seal where all of the air lines connect. Be sure to replace the O-rings when repairing any air suspension system. “We got the new struts a couple of days ago and had our regular mechanic install them. We are so pleased with how everything turned out. Can’t wait to really test them out (weather has been really bad and roads really slippery since the big snowfall last weekend). Thanks for the quick turnaround and the reasonable prices! Also, many thanks to the helpful staff in your customer service area. I purchased the XN44-F3; XN44-R3 kit to replace my air suspension. Installation took me 3-1/2 hrs. I am pretty tooled up so had everything I needed. Instructions said spring compressors not required, I recommend them. Make sure you know how to disconnect ball joints. The new springs sagged and I will look for spacers to raise the vehicle back up to a more acceptable height. The ride is the same as stock. One break in problem I had was turning while hitting a bump I would get a loud squelch noise. I think it was from the paint on the spring contact points. It no longer makes the noise once everything broke in. There is no “Home” solution to turn off the Air Bag warning system. You have to take your vehicle to Ford and have them reset your computer. Note: before you start the swap, remove the rear axel sensors so you don’t ruin them. Overall, I am very happy with this kit and knowing that I do not have to worry about the air suspension going flat randomly. “…we want to thank you after all the trouble that we’ve had with the “”Expedition”” of our customer. Both are very content – the customer can use his car now also in wintertime and of cause ourselves because we have another satisfied customer thanks to team of strutmasters for prompt and perfect delivery!